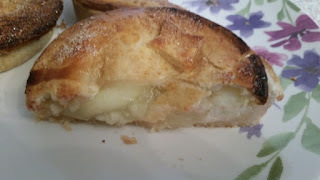 continue reading "British Pie Awards 2017"
continue reading "Open Letter to Mary Berry about top crust pies"
continue reading "Can Piebury Corner The Fruit Pie Market?" 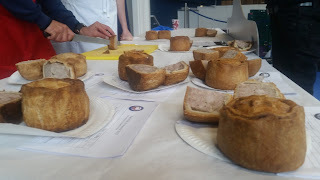 continue reading "British Pie Week 2017 - Day Seven"
continue reading "British Pie Week 2017 - Day Six"
continue reading "Pull the Other One"
On the day of the results for the British Pie Awards we're having a bit of a London adventure, with Pierateer Rob heading down to London on a pie tour to rival all pie tours! With planned visits to Piebury Corner, Pieminister, Holborn Dining (to meet chef Calum Franklin) and The Windmill Pie Room, follow his pie antics all day right here! 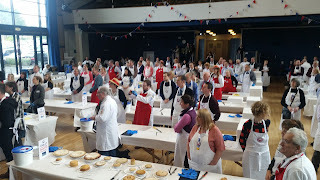 Plus if you read our British Pie Week - Day Four review you'll know we reached another big milestone - our 600,000th pageview! Helped by over 8,000 views of our "Everything you need to know about British Pie Week" article this already has the makings of the most viewed March pageviews in Pierate history, and we've this morning just reached 10,000 pageviews since British Pie Week started on Monday! 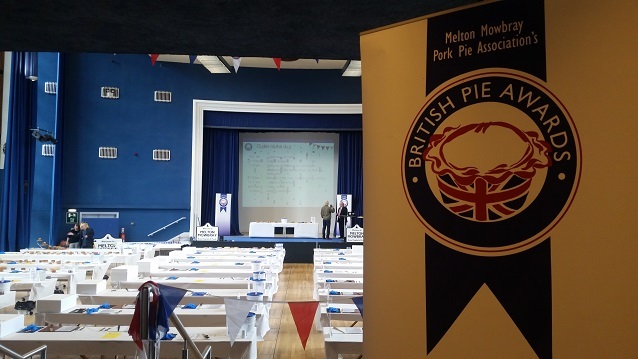 Once again, we're delighted you've chosen us as the home of British Pie Week! 09.55 - Time to catch the train down to London! Glad Chiltern Railways haven't charged me extra for my pie seat (which contains 3 new pies from Nice Pie to rate this weekend)! I'm using their free wifi to blog and tweet about pies, of course! 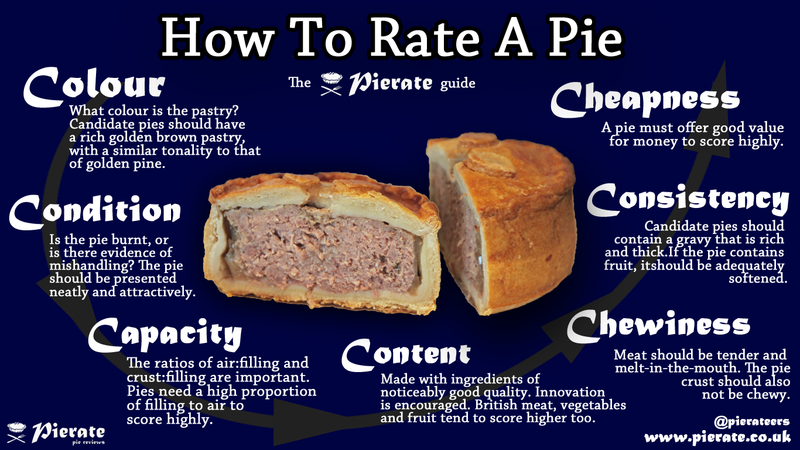 @pierateers All pies travel free due to them tasting so good. What kind of pie did you get? 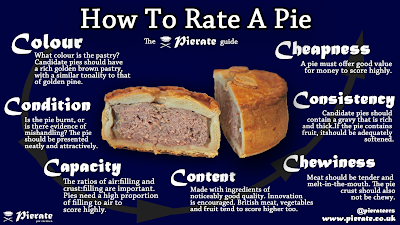 11.00 - One glance at the top of our pie rankings and you'll have heard of Piebury Corner! I'm really looking forward to seeing the owners again and chatting pie, while picking up a few more of their pies for lunch with friends Barnaby and Ro! 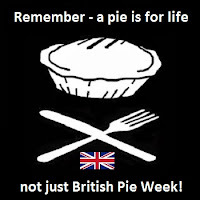 Then it will be on to Pieminister to pick up a cricket pie! (Yes, you read that right - check out our preview of the Cricket Pie here!) 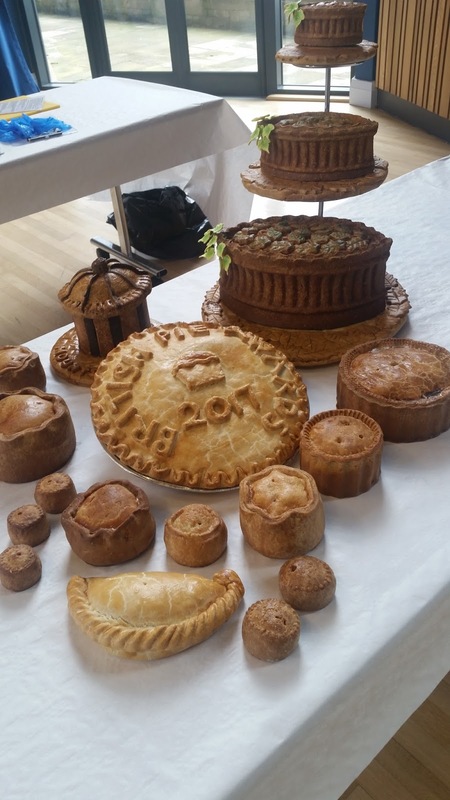 I'm also really looking forward to meeting Chef Calum, who has been posting the most amazing pie pastry artwork on twitter this week! And finally dinner pie at The Windmill, Mayfair, before heading for the train to Leeds for our British Pie Week Pierateer Piefest! It's gonna be busy!!! 12.15 - Arrived at Piebury Corner and was greeted by owner Paul and his wife, who told us about their latest project - a brand new shop in Kings Cross! It's due to open in a couple of months and we can't wait to tuck into a pie there when the new store opens! Paul kindly treated us to a few pies to share with friends I'm visiting (couldn't resist another Thierry Henry Venison pie!) 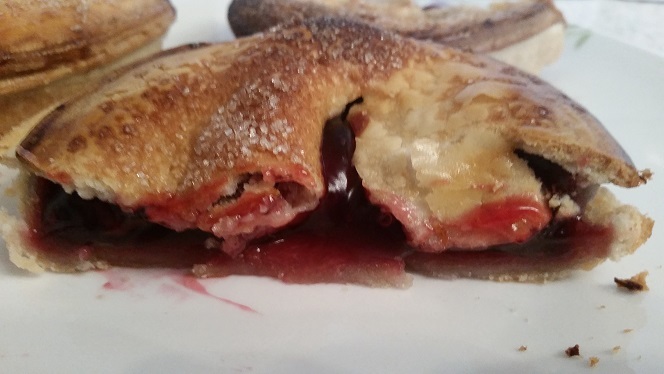 and we've got some fruit pies to rate this weekend! 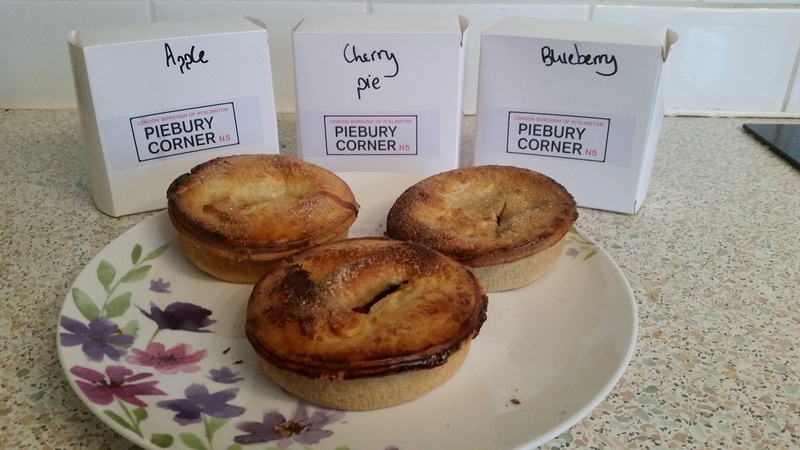 We also are now the proud owners of a Piebury Corner mug! 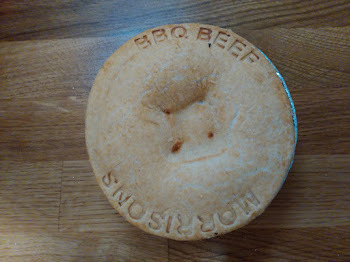 12.45 - Met with friends Barnaby and Ro, having a delicious venison pie from Piebury Corner. Every bit as good as I remembered! 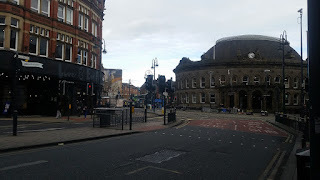 3.45 - Got across to Pieminister (Leather Lane) and picked up the Cricket pie that we had arranged to. 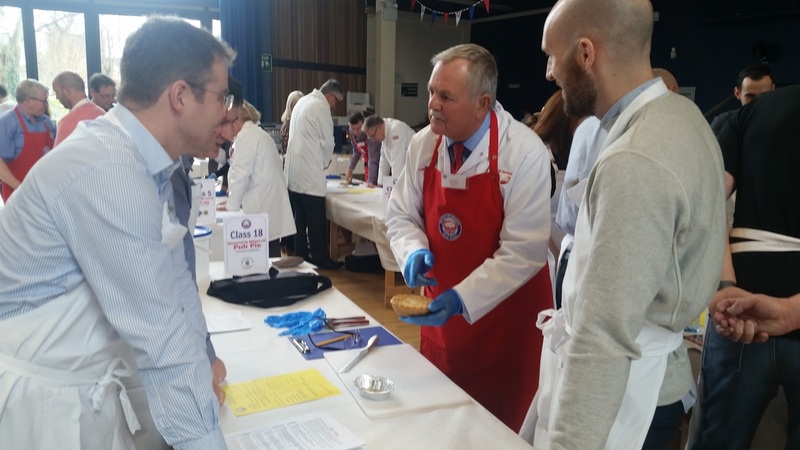 Had a nice chat with the owner, who told us their £5 pie and mash deal for British Pie Week was going down a storm! We'll review the cricket pie this weekend! 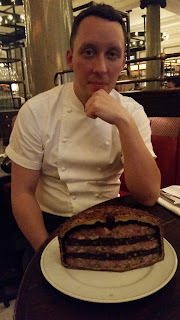 4.15 - I arrived at Holborn Dining to meet Chef Calum Franklin. 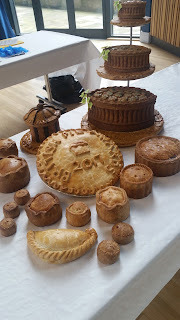 His twitter account this past week has been full of amazing pie photos - his pastry work is exquisite - and we were delighted he could spend almost half an hour talking pie with us. 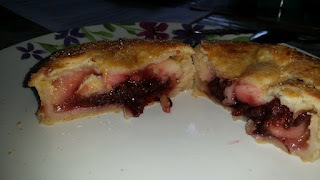 Look out for our interview write up soon and a review of the pies he shared with us. 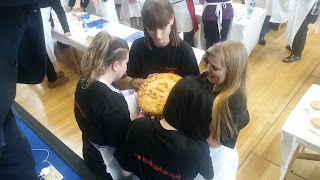 What was particularly exciting was his passion for pies and increasing the quality of the fancy pie selection they offer, as well as training new chefs in the art of pastry work. In the next couple of months, they hope to increase their pie menu to 4 pies and we hope to pay them a visit when it launches! 6.00 - Having arrived at The Windmill in Mayfair, I'm looking forward to trying some of the most eagerly anticipated pies we've heard of - after Pierateer Sam gave them Pierate Recommended status last time he visited two years ago! We'll also find out if we're winners in their #WindmillWin com-pie-tition! Tonight pies really could win prizes! 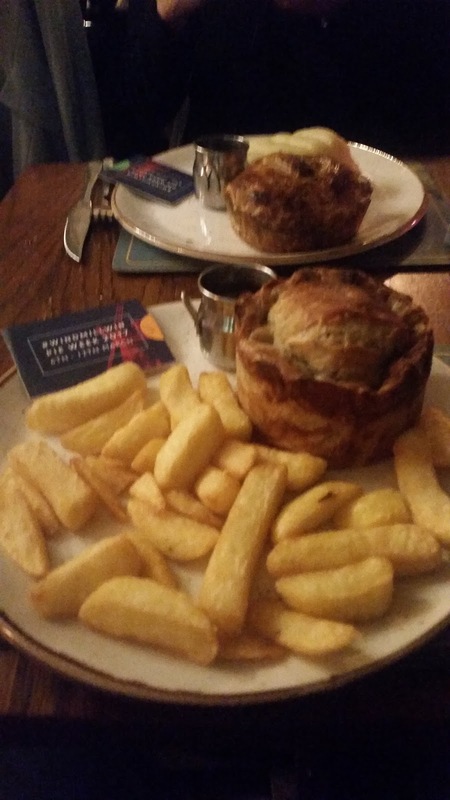 7.30 - Well they were two very highly recommended pies! Great suet pastry, top filling! Having met up with Pierateer Tim, we went halves on a Chicken, Ham and Leek pie and a Venison pie. Also met a nice group of Kiwis on the table next to us who were enjoying their taste of UK pie! They picked a good place to start! Having to dash for a train now but looking forward to reviewing them both! 8.05 - We've caught the train from London to Leeds and look forward to kicking off our #LeedsPieTour tomorrow - not forgetting Tim's "9 pies in a day" Triple Pie-thagarous in Leeds to come! 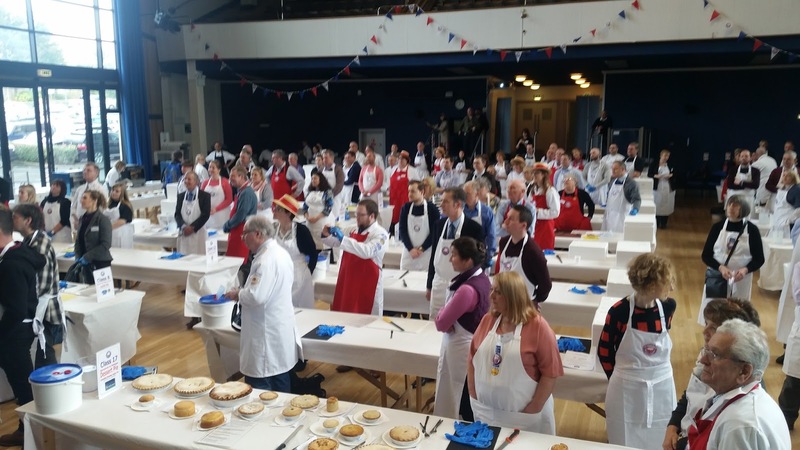 continue reading "British Pie Week 2017 - Day Five"
continue reading "British Pie Week 2017 - Day Four"
Is is a cake? Is it a pie? Why yes, yes it is! Hooray! 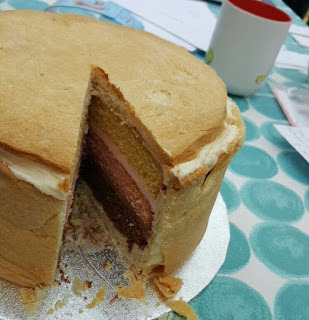 British Pie Week is upon us once more - and what better way to celebrate than by baking an enormous, stripy, sugary cake pie? 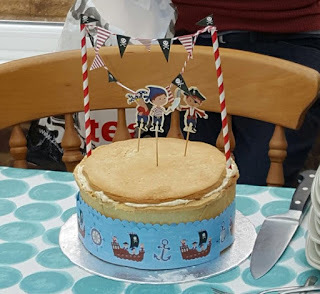 I first made this back in July for a Pierateer celebration, and now I'm going to show you how you can make your very own version. Cream the butter and sugar together, then beat in the eggs a little at a time. Fold in the flour, then add the colouring and flavouring. Bake at 180 degrees centigrade for 25 minutes or so, until the cake is cooked through and springy to the touch. As you can see, this method works pretty well! 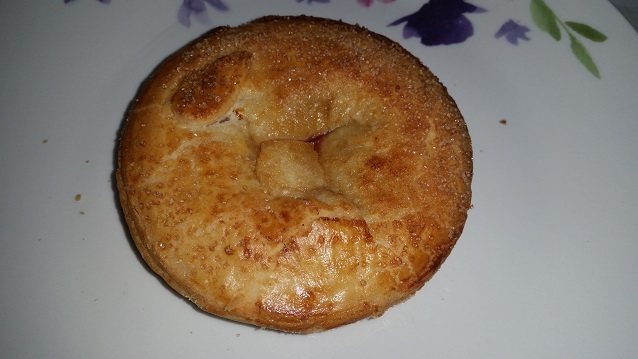 I also made a pastry lid by cutting out a circle of pastry the same size as my cakes, then baking it in the oven between two flat baking trays to stop it from puffing up too much. Chocolate icing ready to go in the pie! At last, you're ready to assemble your cake pie! Now it's all just a matter of layering - I started with cake, then the matching icing, then cake, then the matching icing, then more cake. Finally, I added the last layer of icing and used that to stick the lid on. 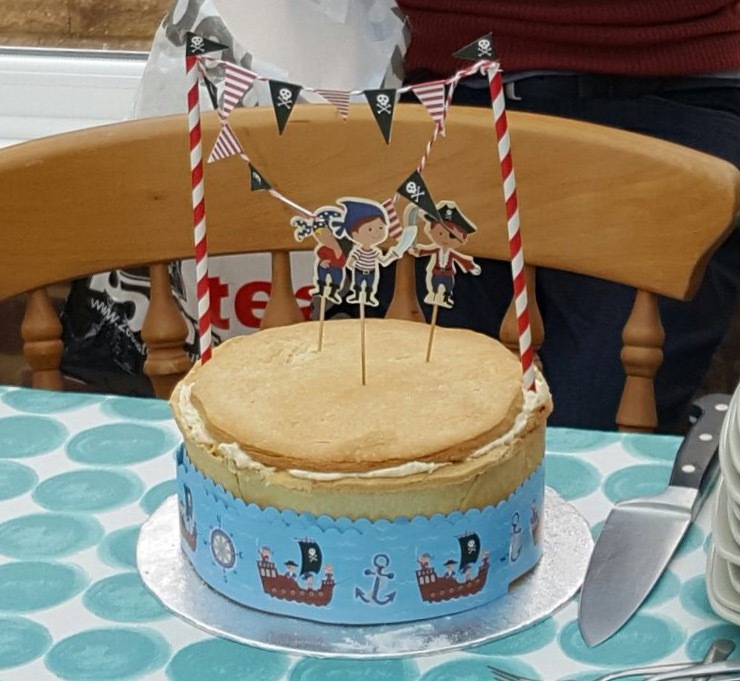 And there you have it, a cake pie! 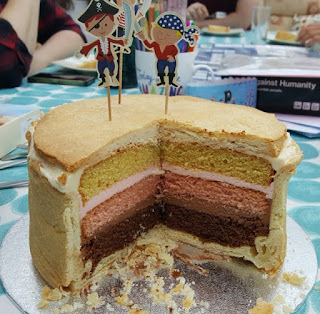 Who wouldn't want a slice of delcious, stripy, Neapolitan ice cream flavoured cake pie? Consistency: Surprisingly good - I was worried it might be a bit dry, but it turns out that soft fluffy cake, creamy icing and crispy pastry go very well together. Capacity: Full to the brim with cake and icing - I had to squash it a bit to get the lid on! Chewiness: No chewiness here - just cake (and icing). 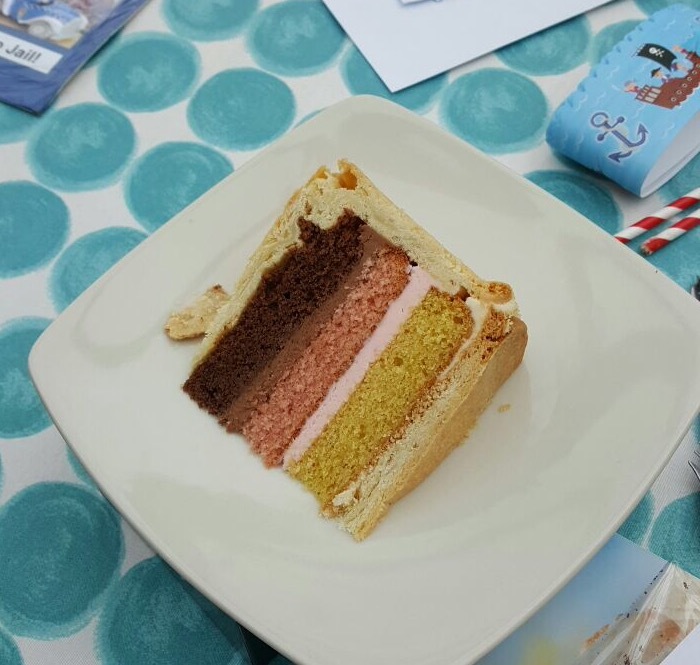 Content: Not only is it a giant pie, not only is it full of cake, but it's stripy and has three different flavours - this one is a real showstopper! 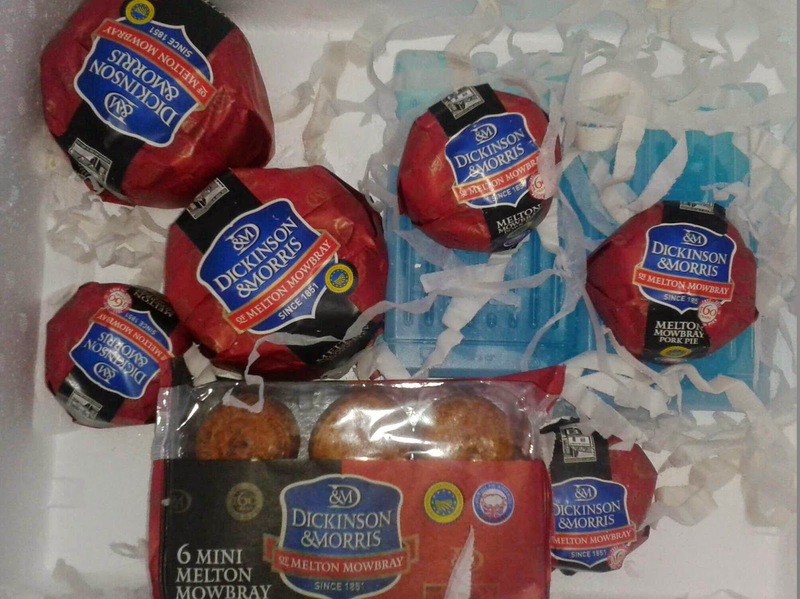 Cheapness: You'll have to buy quite a lot of flour, butter and sugar, but if you've got a well stocked baking cupboard this won't break the bank - you could also make a smaller (and cheaper) version. 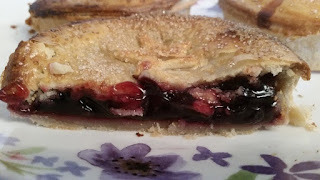 This is quite possibly my favourite pie ever, and it might even be one of the best things I've ever baked - it was certainly worth the time and effort it took to make it! 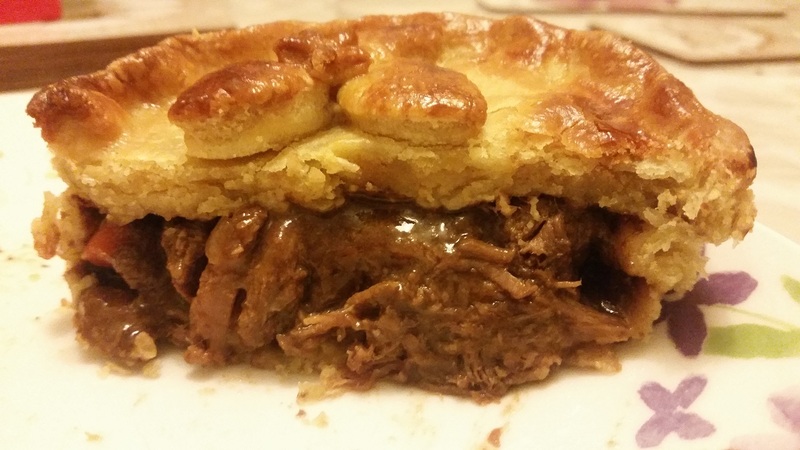 If you're looking for a way to celebrate British Pie Week, this is the way to do it! continue reading "British Pie Week Reci-pie: Cake Pie!"